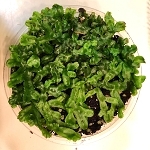 This rare epiphytic fern is perfect for terrariums of nearly any size. Elongated, simple green fronds have no divisions so appear like bright green shields. 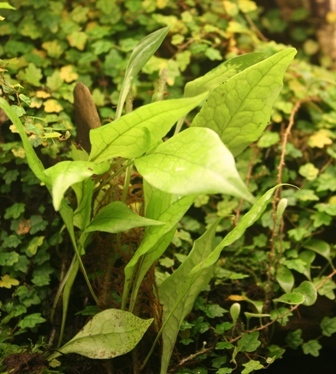 The frond size can vary from 1" to 8" long but tend to stay small in the terrarium. We use this plant extensively in our terrariums as it is quick to establish and grows very well under tropical conditions with high humidity. Many species of dart frog like to use the fronds for egg laying and it provides lots of cover as the fuzzy rhizome spreads throughout the terrarium. Plants are sold as mossed cuttings 12" long and are easy to establish in the moist and humid terrarium.